These identical brothers have been on my “must listen to” list forever. 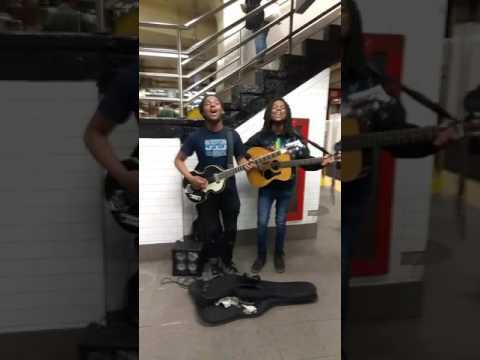 After a viral video of Rahiem and Amiri Taylor started showing up on my Facebook feed, they had me at their latest Beatles cover song. Not only was Blac Rabbit started by these brothers, but, the band has slowly expanded to a four-piece. Maybe it’s the fact that Rockaway Beach is the setting for Blac Rabbit because of the history of the location. That has not gone unnoticed, this group of musicians has a special quality when it comes to classic songs. Blac Rabbit classifies their sound as psychedelic for all the right purposes. Since high school Amiri and Rahiem Taylor have been writing songs, between the decades of the 1960’s to the 1980’s, the brothers decided to learn from the greats. Especially when it came down to songwriting, Lennon, and McCartney who would go on toe influence them today. At times it’s hard for a band that starts out doing covers to venture away from it, yet, with Blac Rabbit you can hear their influence along with evolving actions. Their track ‘All Good’ plays own simplistic lyrics by capturing a reactive approach to a situation. All the while, transforming the song into a delightful rhythmic case of singular identity. The longer I have listened to this band, the more you hear every element coming into play. The special quality about Blac Rabbit is hearing snippets that you did not catch before. Giving their audience a malleable chance at witnessing a piece of music we do not come across a lot or even at all by today’s standards.